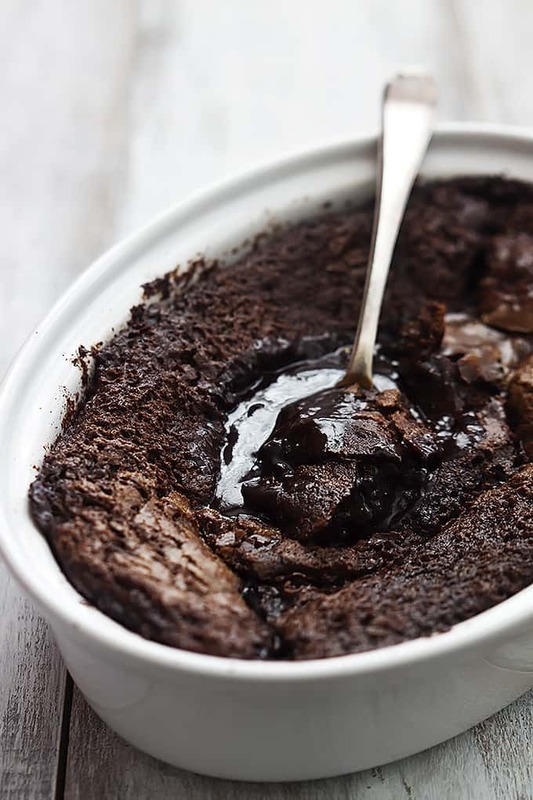 Ooey gooey fudge sauce with moist and chewy chocolate brownie top this Chocolate Cobbler! Serve with ice cream for the ultimate treat! Today I’m suffering a bad case of cruise nostalgia. You might remember that instead of giving each other presents to open this year, we went on a cruise right before Christmas. It. was. awesome. That was my second cruise – the hubbs has been on many more – and both of the cruises we’ve taken together have been on the same cruise line. Each night in the dining room they have different dinner and dessert options but there are a couple of things that are so popular they are available every day. One of those is my husband’s favorite dessert on the planet: a little something called “warm chocolate melting cake”. 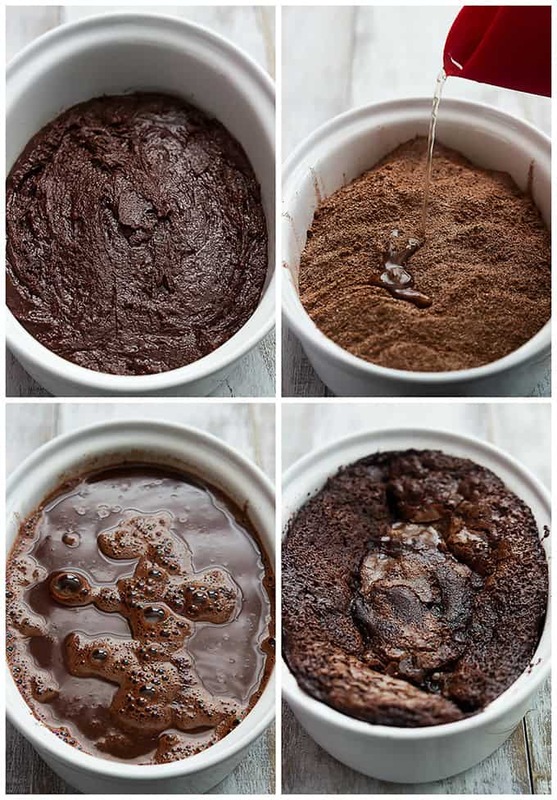 Warm chocolate melting cake is a lot like “lava cake” but my husband swears it’s not the same thing. That being said… the idea is basically the same. In warm chocolate melting cake, the top half if moist chocolate cake/brownie stuff and the bottom half is ooey gooey fudgy chocolate sauce. Basically a chocolate-lover’s personal paradise. We ordered warm chocolate melting cake every single night on the cruise with two, not one, scoops of ice cream. It’s FREAKING AMAZING. 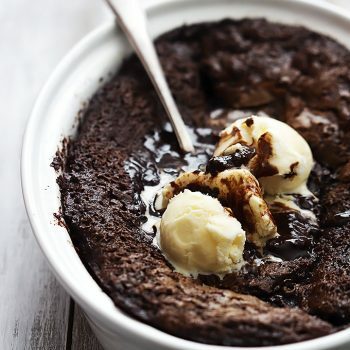 And yeah, you guessed it… this chocolate cobbler tastes like warm chocolate melting cake. 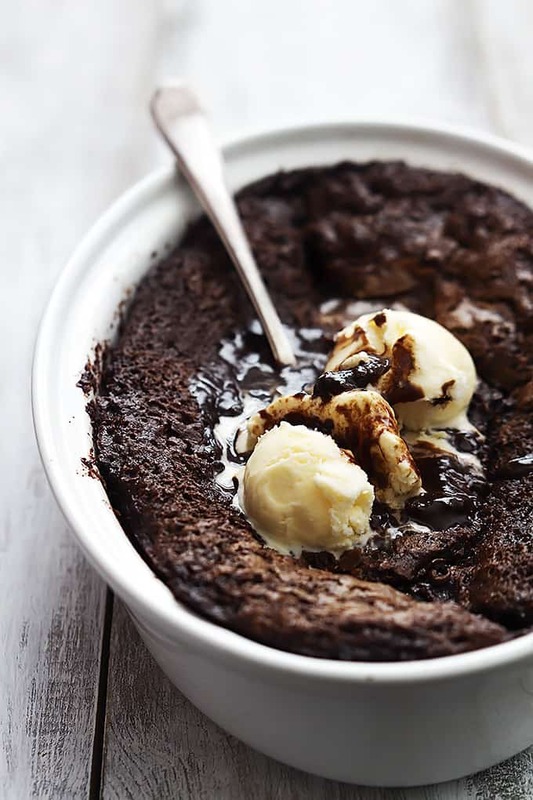 If you are a chocolate lover and you fancy the whole warm-cold combo that you get with certain desserts like cobblers, you need to make this cobbler. pronto. 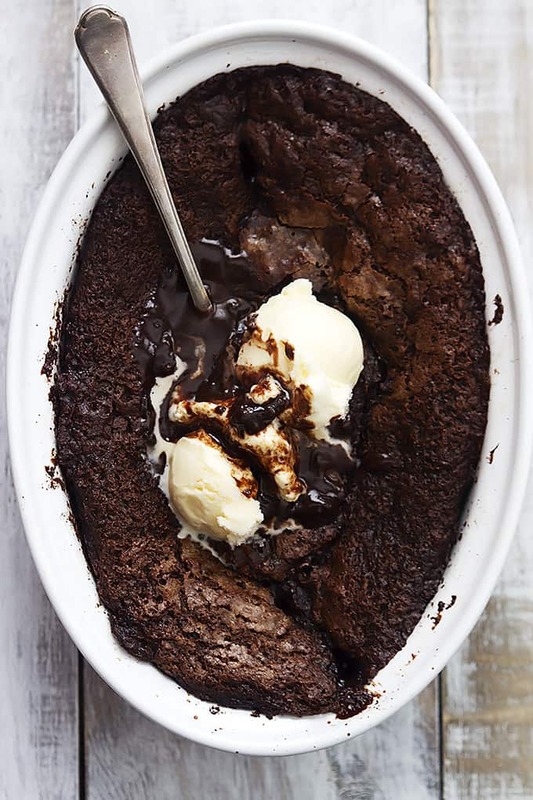 Ooey gooey fudge sauce with moist and chewy chocolate brownie on top! Top it with ice cream for the ultimate treat! Preheat oven to 350 degrees and grease a 2-quart casserole or baking dish. First prepare the base. In a medium bowl combine sugar, flour, cocoa powder, baking powder, and salt - whisk well. In another bowl (or liquid measuring cup) whisk milk and melted butter. Add wet ingredients and mix until combined. (A few small lumps are okay) Spread mixture in the bottom of prepared dish. Next prepare the top layer. In a small bowl whisk together sugar, brown sugar, cocoa powder, and salt. Sprinkle mixture on top of your base in the baking dish. Stir vanilla into hot water. Slowly pour water over the sugar mixture. Bake for 30-45 minutes until the middle is mostly set. (Just give it a little shake - if it still moves a lot in the middle, it's not quite ready) Serve warm with ice cream. Recipe slightly adapted from South Your Mouth. I love the idea of splitting vanilla with half almond extract! Lovely flavor 🙂 And also beyond obsessed with this ooey gooey goodness. The boiling water probably creates the most melty deliciousness! I love to make this whenever I’m out of eggs. I’ve been baking it for more years than i care to count! Cruise nostalgia. Ha! I wish I had cruise nostalgia, because it would mean I recently went on a cruise. Sigh… At least I have this chocolate cobbler to keep my company. ha so true! But just close your eyes and take a bite – you’ll feel like you’re in paradise trust me. Um the amount of chocolate in this dessert shouldn’t be allowed because it looks absolutely delicious!! I would eat this entire thing myself!! Looks yummy! Could this be made afew hours in advance and re warmed before serving? I’m not gonna lie, when I made this the other week, I spent all day thinking about it, waiting to get home so I could have another delicious piece! It’s dangerous how easy this is, and how many of the ingredients I keep on hand! I’m so glad you love this as much as I do! Can’t get enough chocolate cobbler! How do you take the flour? spoon method or straight from the jar? I take it straight from the jar and level it. Thanks for your feedback, Ashley! !